The old saying "the hair of the dog that bit you" is a common theory for curing a hangover. Most people choose a Bloody Mary, but the thick, red drink can be rather upsetting to look at, much less drink when you're in the midst of a hellacious hangover. The Hair of the Dog cocktail from Bulldog Gin is a great alternative that serves the same purpose. A little bit of alcohol (okay, a lot... that's a 6-ounce pour! ), a sour citrus and the spicy heat of a pepper to awaken the senses, calm the stomach and, hopefully, give you a little boost in your day. Unless you have a Bloody Mary mix ready to go, this Hair of the Dog is easier to mix. That's an attribute you'll appreciate when your head is splitting and your stomach is churning. Pour the Bulldog Gin and Tabasco into an ice-filled cocktail shaker. 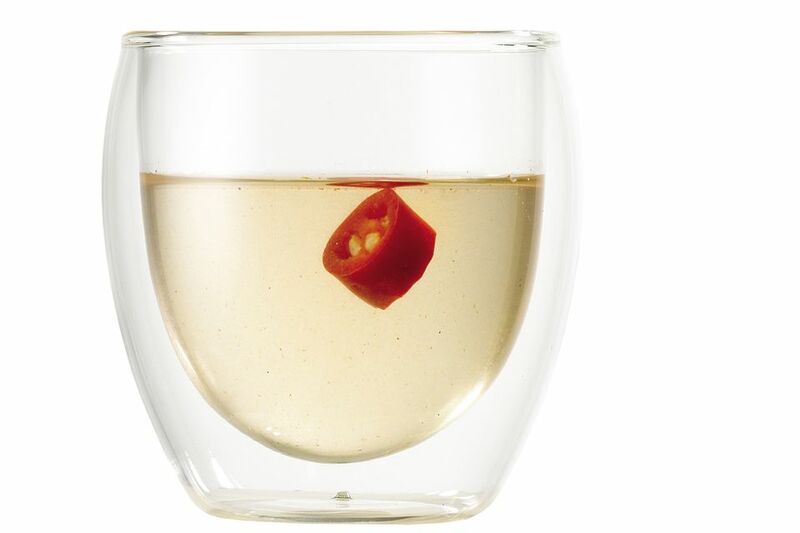 Garnish with a chili pepper. Tip: That 6-ounce pour of gin is a lot of liquor! In reality, I would recommend starting with just 2 to 3 ounces and 1/4 ounce of lemon juice. If that doesn't work, mix up another drink. Remember to wash your hands well with soap (especially before touching your eyes) if you handle the chili pepper. Will This Hair of the Dog Really Cure My Hangover? There really is no way to tell, that's the simple truth of it all! Every hangover is different and every drinker has their own tricks for recovery. You have to realize that six ounces of gin is three times the average shot of liquor. So, yes, this is a 'hair of the dog' recipe in that you're adding more liquor to your post-drunk experience. Effectively, you are putting off the pain. At best, you may be easing out of the nasty effects of your hangover as the liquor leaves your body at a more controlled rate than it did overnight. Is this method effective or are you just prolonging the pain? That is going to depend on your body and how much you continue to drink after sipping this spicy drink. It's a decision you need to make and if you're headed to work or have to drive anywhere, I definitely do not recommend this. How Strong Is the Hair of the Dog? I have already said that there is a lot of gin in this recipe and that means that this is going to be a very potent drink. If you were to mix up a Hair of the Dog using the 80-proof Bulldog (or an equivalent), then it would weigh in at around 34 percent ABV (68 proof). Let's put that into perspective for a minute. This is just a few steps below the bottling strength of the gin (40 percent ABV or 80 proof). It is also stronger than any of the Corpse Reviver recipes and those are said to 'wake the dead' drunk from their stupor.